Disclaimer: I’m not a skilled photographer, just a traveler who loves taking pictures to keep the memories alive. 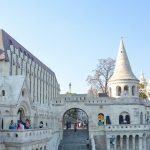 Arches, bridges and castles, oh my! Central Park is a green oasis in the middle of Manhattan’s concrete jungle and even if you’re one of those travelers who goes to great pains to avoid ‘tourist traps’, this is an experience you should not miss if you’re visiting New York City. I’ve conquered the park during every season, and it wears each one well. 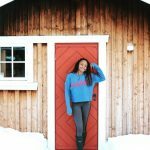 As an island girl however, I prefer warm temperatures, so my recommendation is to exploring it in the summer. I did. All by myself. Just because. And it was beautiful. At first I was intimidated by its 3.41 square kilometers, then I discovered the Central Park app. 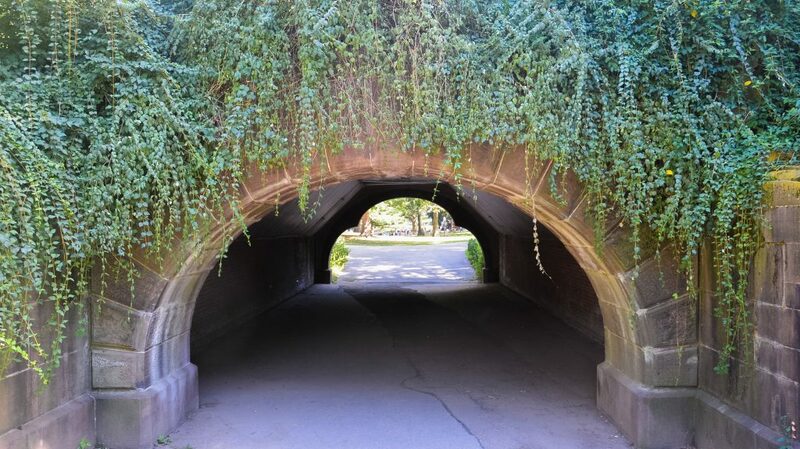 The free app covers every inch of the park and made exploring just over 50 blocks of bridges, arches, lawns, and lakes a lot easier. For eight hours, spanning two days, my loyal Sketchers (highly recommend them if you’re in the market for trendy walking kicks) and I walked trails, climbed rocks, dodged bikes, and got a little lost only once in Manhattan’s great green playground. At the end of it all I was exhausted but my memory card was full because everywhere I turned (intentionally or otherwise) there was something beautiful to capture. As I said before, I’m not a professional photographer. I just own a DSLR camera and love having pictures to look back on my travels. 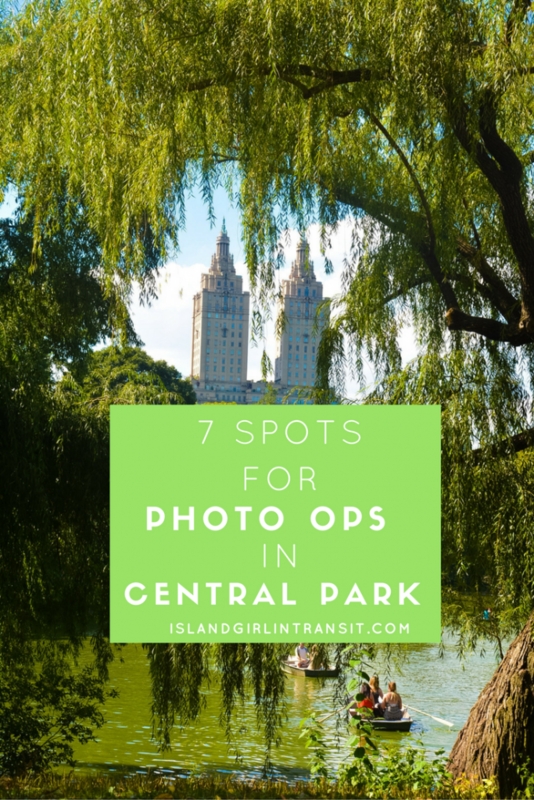 That being said, here are 7 beautiful places for photo ops Central Park, whether you’re capturing memories or selfies! 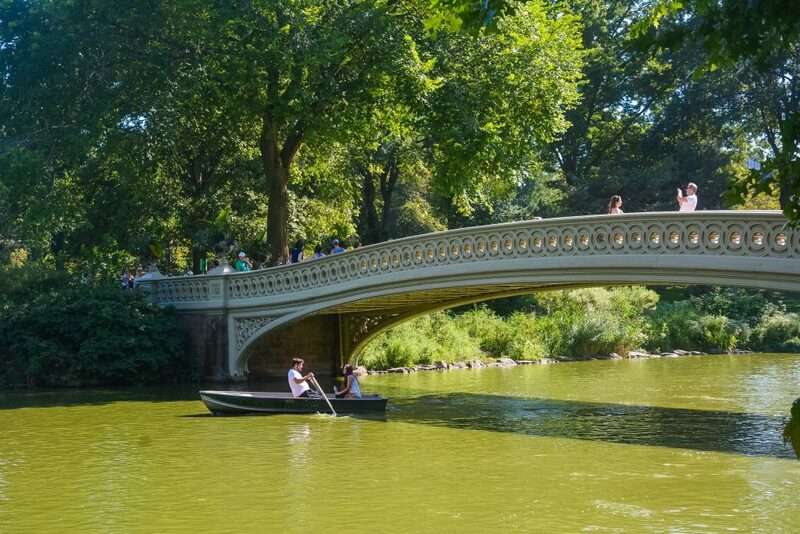 If you haven’t heard of the Bow Bridge you’ve seen it in at least one NYC-based movie. NB: You can’t avoid the throngs of people on the bridge attempting to get the perfect shot from the perfect angle, but that’s OK. Enjoy a leisurely walk across the cast iron bridge. Snap a few shots if you feel so inclined, but don’t feel pressured to get it just right. The best vantage point is actually off the bridge, just as you enter the Ramble. Find a spot on the water’s edge and take your time capturing the full scene of the bridge the trees, and the boats passing below. I am in love with this arch. I might be the only one that feels this way, as hardly anyone walked past it for the significant amount of time I was there ,and nary a soul stopped to take any photos. But I love the quirky fact that it has two very different patterns on either side of the short tunnel. The trefoil, which its named after, is featured on the eastern wall while the west side sports a simple, round frame. I’ve always wondered how that happened…did they run out of bricks or just get lazy? 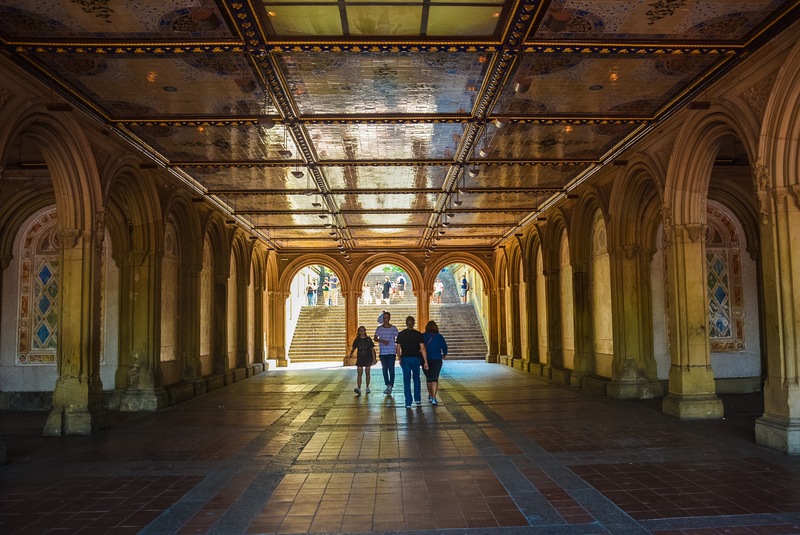 Beautiful both on the outside and within, the Bethesda Terrace reminds me of Disney princess movies (and not just because Amy Adams’ and Patrick Dempsey’s movie, Enchanted, filmed a scene there). 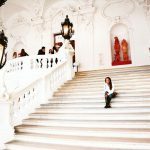 The massive stone steps with its intricate designs were obviously made to facilitate dramatic sprints by overdressed princesses. While the detailed tile work and arches below are what you would expect to find within the walls of a palace. It’s impossible to find the terrace completely void of people, but patience is a virtue. Wait around long enough and pounce on that window of opportunity when there are fewer bodies to crowd your frame. 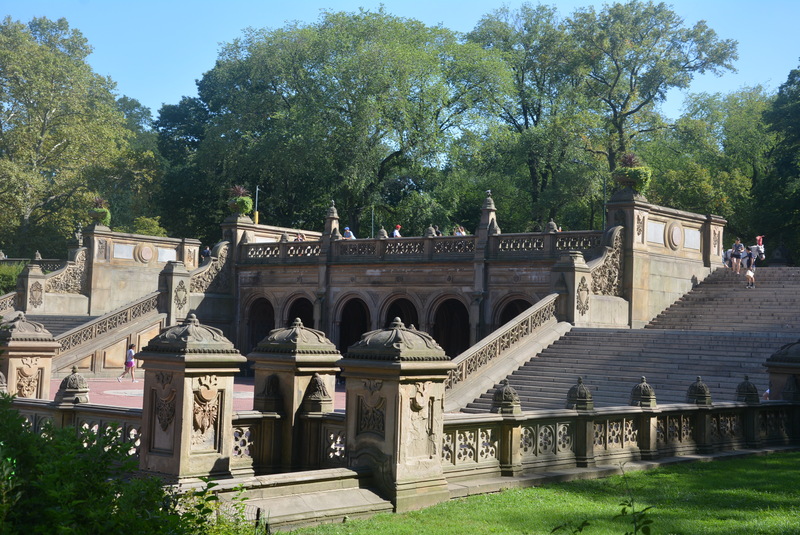 Just a few feet away from the Bethesda Terrace is the Bethesda Fountain. Expect it to be overrun with people standing in front of it or siting on its perimeter to take pictures. I would never expect to get the fountain free of people so instead of battling with the crowd I bypassed it all together. 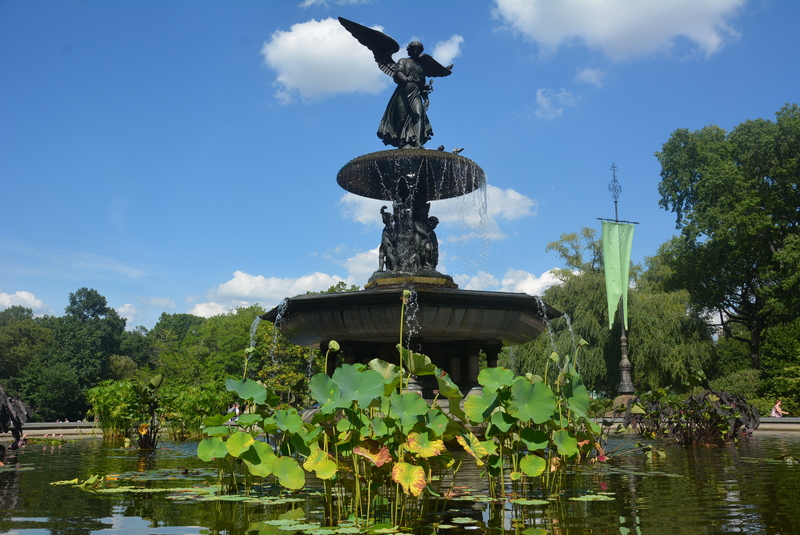 It worked well to lean in and focused my lens on the fountain, the water, the lilies, and of course that brilliant blue sky. Every girl loves a castle, including this Island Girl. 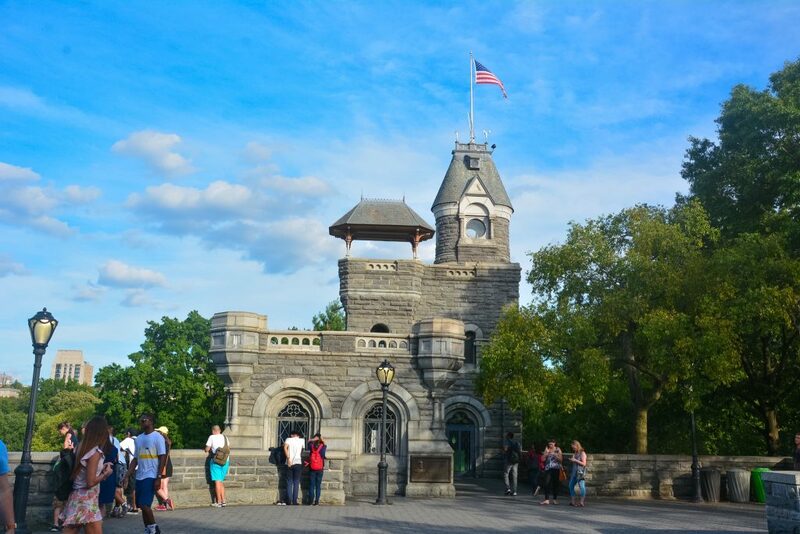 Belvedere Castle isn’t as imposing as I had hoped but it’s adorable to look at and even cuter to photograph. As crowded as it was, I still enjoyed snapping this pic but the true vantage point is from the lawn across Turtle Pond. I just encountered a minor glitch: the afternoon sun sets behind the castle. At the time I was there, all you could get from that angle is shadows and glare. Note to self: get to the park in the morning for this one. 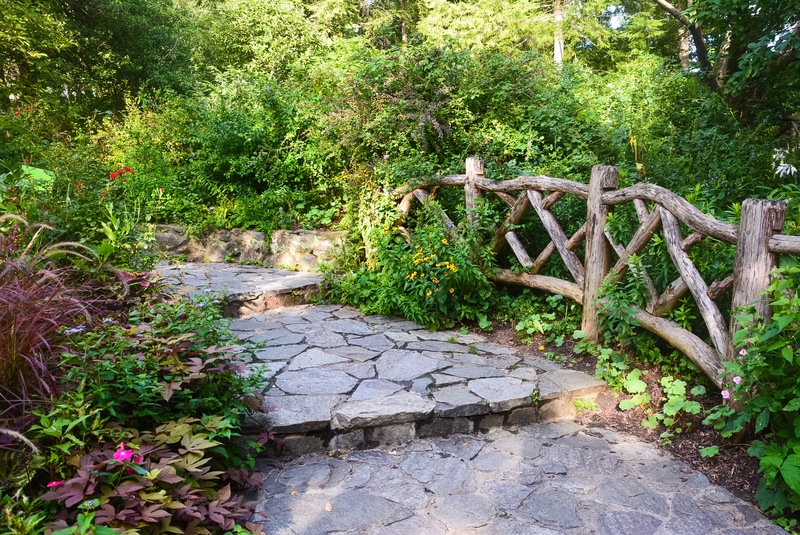 Stone walkways, log fences, and brightly colored blooms make the Shakespeare Garden one of the brightest places in Central Park – in my opinion. I appreciate how the bright pink and purple and red flowers blossoming in this tribute to the playwright broke up the monotony of the green grass and gray stones that dominate the area. The setting is perfectly designed and maintained but still feels all natural. There are always people in the garden but with all the twists and turns its not difficult to find an empty stretch of walkway. Ladies Pavilion looks as dainty as it sounds and I love it! Initially, I wasn’t sure it was worth the trek so far off my charted course but it was. Even though it had been taken over by a wedding party. The pavilion is literally off the beaten path so you have to follow a narrow, stone studded trail along the water’s edge to get to it. As soon as you clear the trees, you’ll find it sitting amidst a green lawn, painting a pretty picture straight out of a Jane Austin novel. 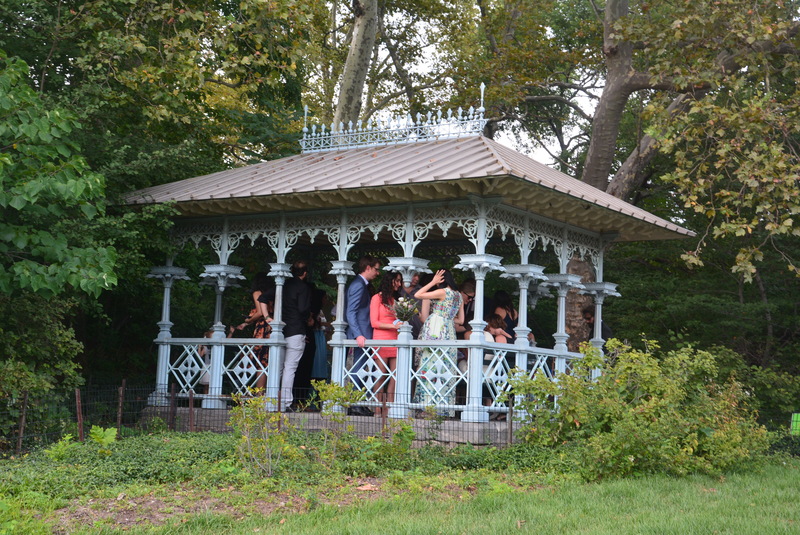 There’s a point of interest in every nook and cranny within Central Park and they’re all waiting to be photographed. Yes, the park is huge and it may seem intimidating to try and cover so much ground, but that’s what the Central Park app is for. Download it next time you’re in NYC and start wandering! Love the Trefoil Arch & Bethseda! Central ParK is probably the most interesting and divers park .. I love it there and seeing your pictures makes me wanna go back and discover the approximately 90% that I haven’t seen yet 🙂 Nice Pictures! I hope you can return and explore the rest of it! Definitely download the app, it’ll make it sooo much easier! Fantastic! I have been to so many places in the US, but not yet NYC. 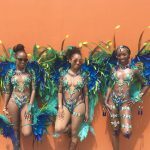 I really need to go – and get all these beautiful photos too! 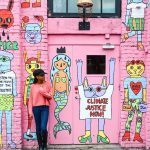 I live in NYC and have never ventured to CP. Seeing your beautiful pictures have definitely piqued my interest. Something’s we just take for granted until someone else reveals it to us.